Give family game night an environmental edge with Terra Toys’ Cheetah Dominoes set, part of the Wildlife Conservation Collection of Games. Made from FSC-Certified timber, the dominoes feature cheetah spots instead of traditional dots. Terra Toys is committed to manufacturing products that are gentle to the earth and give back to it: the paints and finishes on the dominoes are water and soy-based, and the company donates 5 percent of the proceeds from the sale of the game to the World Wildlife Fund. All of the games in the expanding conservation collection feature endangered species and habitats, so kids can play and learn a bit of ecology at the same time. So whip up a batch of crunchy kale chips or soft pretzels and settle in for a night of healthy competition. 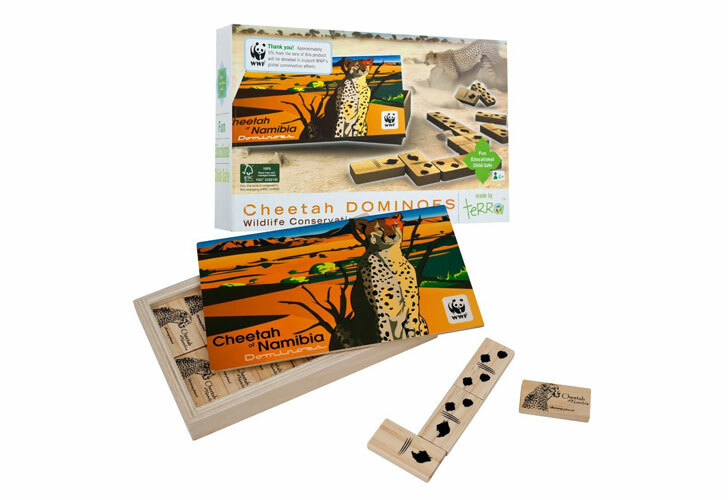 Give family game night an environmental edge with Terra Toys� Cheetah Dominoes set, part of the Wildlife Conservation Collection of Games. Made from FSC-Certified timber, the dominoes feature cheetah spots instead of traditional dots. Terra Toys is committed to manufacturing products that are gentle to the earth and give back to it: the paints and finishes on the dominoes are water and soy-based, and the company donates 5 percent of the proceeds from the sale of the game to the World Wildlife Fund. All of the games in the expanding conservation collection feature endangered species and habitats, so kids can play and learn a bit of ecology at the same time. So whip up a batch of crunchy kale chips �or soft pretzels�and settle in for a night of healthy competition.